There are a number of methods to retie springs. To see some other techniques, go here: Spring Tying Techniques. The method used on the page is meant to be used when the sofa has loose cushions. The springs are tie so that the top is flat and the front edge of the springs protrudes out to be in line with the frame of the sofa. The center row of springs is used as the anchor row. 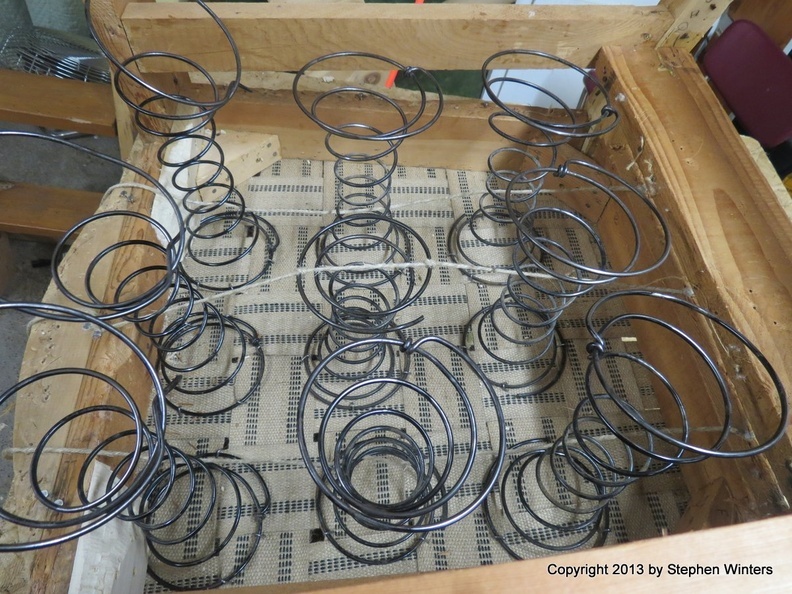 When retying springs, here are some basic guidelines. Use a good quality webbing (such as the jute with the red stripe). All the weight of a person will be held up by the webbing. Don't use cheap webbing. Polyester twine, which has a ... of about 400 lbs. (This is stronger, but it tends to stretch a little with use, which makes the springs not quite as tight ... and .. But it is still quite useable. Unless the old edgewire is in excellant shape, it is usually best to replace the edgewire when you retie the springs. As you tie the springs one important thing is to keep the twine tight so that the spring will stay compressed. If you keep the twine tight, then the springs will stay compressed. So, at each step make sure that that twine is tight. That takes a little bit of practice, so, as you have been doing, don't worry if you have to redo it a few times. Why don't you try using a single spring as the anchor. I don't know that it makes much difference whether you use a second row or the third row. So, let us make a choice and use the third row as the anchor. At this point, don't take everything loose. But let us just try to get this one right first. I will just explain it step by step as if we were starting from the beginning. (Don't worry if you have already done some (such as cutting the twine to length). Use a heavy metal object (i.e. hammer head) to dull all of the sharp edges on the frame where the twine will cross. The object is to prevent the twine from being cut by the sharp corners of the frame. Attach the webbing to the sofa bottom. Attach the springs to the webbing. Cut each length of twine about 2 1/2 times the distance from the front to the back of the sofa. Firmly attach the back of that twine to the back of the sofa in a place where it will come over the bottom rail towards the front. The spring is straight up, not slanted. While keeping the twine tight tie another half knot at the front side of the spring top edge. All during this time, keep the twine pulled tight. This is key to keeping the twine from slipping and loosening. if using nails, wrap the twine around the nail that you previous drove in halfway. Now compress the spring to the right height while you pull and tighten the twine around the nail. If you are using staples, pull the twine over the edged of the front rail (that you previously dulled). Now we are ready to tie the next row of twine, we will tie the next two springs (the spring in front and to the rear of the anchor spring. Again, cut the twine about 2 1/2 times the distance from the front to the back of the sofa. However, instead of attaching the twine to the back of the sofa first, we started in the middle. Find the middle of the twine, then tie the twine to the top front and back edge of the anchor spring. That will give you two loose twine ends extending foward and backward from the anchor spring. Next, bring the front twine forward and tie a loose half-knot about the rear edge of the next spring forward. Hold the top of that spring in the center between the anchor spring and the front spring while you cinch down the half-knot. Bringing the twine foward to 1 rung down on the front of the spring, loosely tie a half-knot around that lower rung, put the twine tight, and then cinch the knot. Not finished, more to come.